Have you ever boarded a plane on Thanksgiving Day with a pink pie box in hand? I have. I don’t know how many fellow travelers have teased me with, “Is that a pumpkin pie for me?” Smile. They don’t know the pink box carries a walnut and chocolate tart, a less sugary cousin of pecan pie. 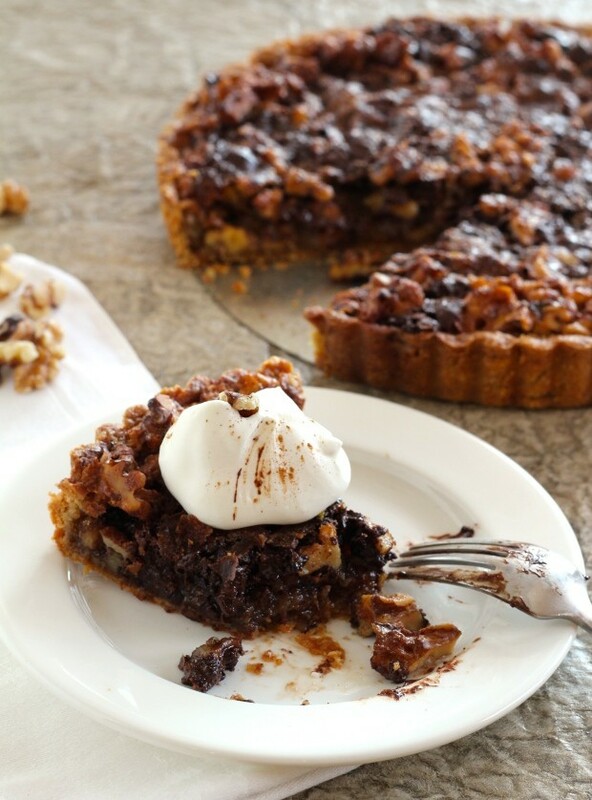 Filled with walnuts, bittersweet chocolate, and maple syrup, this tart is not excessively sweet. And not what you’d expect. You can see by the photo that the filling is dark in chocolate—and when it’s still warm, that chocolate is soft and oozy, like a chocolate chip cookie that spent the afternoon in a hot car. Those chopped walnut pieces provide plenty of chunk, and their slightly bitter skins even out chocolate’s richness. Like I said, sweet, but not too much. 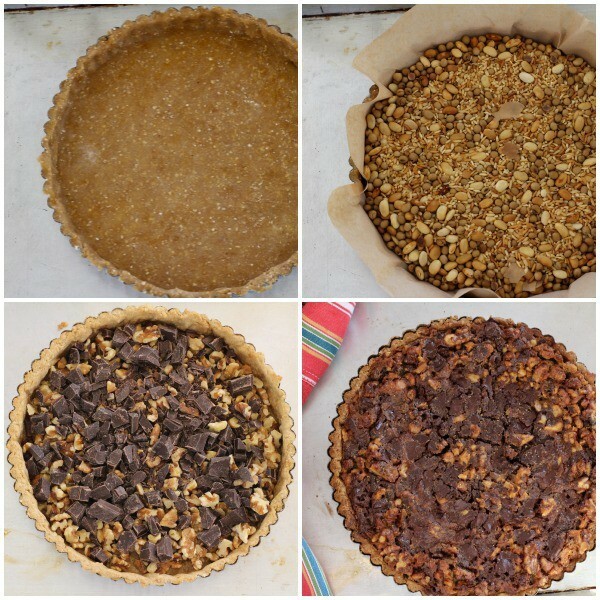 Click here to PIN Maple Walnut Chocolate Tart! No processed sugar here. Well, except for the chocolate. Sugar in chocolate doesn’t count, right? I used my oat pie pastry for the crust, with coconut sugar replacing white sugar, and whole wheat pastry flour taking the place of all-purpose flour. Both bump up the flavor and health quotient. This recipe can be either a pie or a tart. It just depends on how you form the crust. Don’t have a fluted tart pan with a removable bottom? Just bake the pastry and filling in a pie plate. Then it’s a pie. When your relatives ask you to bake the pies, say of course. But bring a tart—this walnut and chocolate one. In a pink pie box. 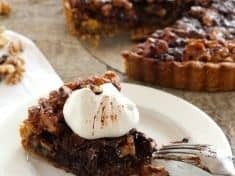 Do you need your walnut and chocolate tart to be gluten free? Use a nut crust—like this one. Because maple syrup is thinner than corn syrup, the typical sweet component in nut pies, I added a bit of cornmeal, the thickener in chess pies, to insure the filling isn’t too runny. Make it a fabulous week–get in the kitchen and try an new dessert! What can I say—this is a very delicious dessert. Serve with vanilla whipped cream, or better yet, vanilla ice cream. Hide a sliver for tomorrow’s breakfast, for even more happiness! Makes one (9-inch) tart or pie--10 to 12 servings. Fit the dough circle into a 9-inch fluted tart ring with removable bottom, pinching extra dough in as needed to build up the sides so they are sturdy. Refrigerate until cold, or freeze 10 minutes. While the crust is blind baking, assemble the filling: Beat the eggs in a bowl using a hand whisk. Whisk in the maple syrup, the molasses if using, the cornmeal, butter, vanilla, salt and cinnamon. Spread the walnuts and chocolate in the bottom of the blind-baked shell. Pour the filling evenly over the nuts and chocolate. Bake 30 to 35 minutes until filling is just set in the middle. Let cool about ½ hour. Serve with vanilla whipped cream and a pinch of cinnamon. Grade B maple syrup is always my first choice. However, the best price for maple syrup seems to be at Costco—and they sell Grade A. The teaspoon of molasses deepens the flavor of the lighter Grade A.
Cornmeal thickens chess pies—and does the same job here. Because maple syrup is thinner than corn syrup, the typical sweet component in nut pies, I added a bit of cornmeal to insure the filling isn’t too runny. Roll leftover dough scraps again and cut into uneven squares. Sprinkle with cinnamon and (coconut) sugar and bake until golden. That’s what my Mom did. To blind bake: Line the pastry in the pan, with parchment paper or aluminum foil that extends 2 to 3 inches above the pan. 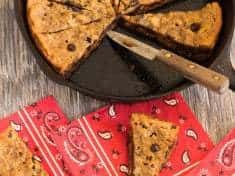 Fill the paper-lined pastry with pie weights or dried beans, making sure the paper and beans are tucked into the corners of the dough to make a sharp inside edge. After removing the blind-baked crust from the oven, let cool five minutes. Carefully remove the paper and pie weights. I just brought my false bottom tart pans up to the mountains, and now I know why! 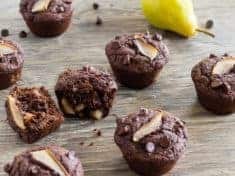 Can’t wait to make this for our chocolate loving friends.